This is a fraud. The present level of charter schools is already bleeding public education dry. And it’s certain that the cap won’t be below what exists in LA or Oakland. According to the LA Times, the agreement includes a 3% pay raise for last year and a 3% pay raise for this year. Teachers had been calling for a reduction in class size. The agreement reportedly calls for a reduction in class size by one student this year, one next year and then two the following year. According to the LA Times, an issue that was extremely important to students – who had massively supported the strike, was the issue of random searches of students. The LA Times reports: “The district also agreed to expand to 28 the number of schools that will no longer conduct random searches of middle and high school students. That provision was especially important to students who marched in support of their teachers.” We don’t know in how many schools these random searches were being carried out, but the schools should never have what amounts to stop and frisk in any school. Oakland teachers beware. They’re going to try the same thing here. And remember this: W. VA. teachers were so effective because their strike was state wide. That’s what’s needed in California. “What?” you say. “That would be illegal.” Well, as Trump and the corporations are proving every day, “legal” is what you can get away with. If it takes everybody going out to enable the teachers to get away with a state-wide strike, then so be it! Maybe we could stay out until the end the government shut-down, give full pay (plus back pay plus the previously scheduled raise) to all federal workers, win a $5/hour pay increase for all, kill the Wall once and for all, and release all asylum seekers. Now, that would be a real victory! The UTLA leaders rushed the mebmers to various sites around Los Angeles to vote for the tentative agreement. Thus was less than 12 hours after the press conference announcing that UTLA had capitulated to LAUSD. Capitulated is strong language. I say this because the core issue of the strike, charter schools,and psychoogical support for students, was allowed to be shifted out of the struggle and into the hands of management. Last year there was much talk of San Francisco, Oakland, Los Angeles, San Bernardino, and San Diego all walking out together. Well, managment and labor traitors put that dream to rest! Nowhere in the tentative agreement does UTLA speak of the ‘teacher jails’ that LAUSD teachers are put into when they are ‘suspected’ of misbehavior. 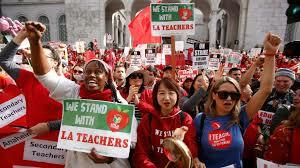 Nowhere does it speak to the use of PAR and ‘teacher jails’ to rid LAUSD of teacher militants or older teacher who draw higher salaries and who may have more experience in teacher struggle. Nowhere does it speak to the racism, sexism, anti seniority-ism and other aspect of the teacher management paradigm and rules, and it fails to criticize the eessence of capitalist education. The ruling class WAS and REMAINS scared, however, of tens of thousands of people in the one of the USA’s largest cities marchng to suppot a strike. If it happened once, it can happen again. The lesson for Oakland and other school districts in who are contemplating going out is – build solidarity with other unions, encourage other unions in the shop (janitors, cafeteria workers, groundkeepers, nurses, substitutes)- to NOT WORK and to NOT CROSS PICKET LINES! LA’s strike fund was not made available to the members on strike. BIG ERROR!!! Does Oakland have one, or will other unions contribute to it! How will Oakland manage its negotiations – publically or behind closed doors? Where will be the place for the workers and masses outside of the OEA in this battle? There are many other questions to be raised and we need meetings and discussions NOW to discuss these ideas. Let’s get to work! It seems that the ones who are even more scared are the union leaders!